Our home is often a sanctuary away from the stresses and strains of modern life. A burglary throws that out of the window. Your home is no longer a nice place to be. Knowing a stranger has entered our home without permission strikes at the very heart of who we are. Suddenly, ‘home’ doesn’t feel safe. Dealing with burglary is often extremely difficult. A burglary is not as traumatic as a violent home invasion, but the after effects are no less devastating. There are many negative emotions attached to a burglary and it is important that you work through these. Many people try to forget that a stranger has been in their home, destroying their belongings and possibly stealing treasured mementos and valuables. It is understandable that you want to push it all into the back of your mind, but you should try to deal with the fallout in a positive way. If you don’t, you could end up dealing with emotional issues at a later date. Most people are in shock when they realize their home has been burgled. Some burglars only steal valuables, but others trash the place and destroy everything in their path. 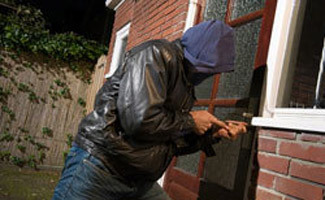 The first thing you must do is report the crime, even if you suspect the burglar is someone known to you. The police will examine the crime scene and take prints to identify the perpetrator. You will have to make a list of everything that is missing and provide photos to assist with the identification of stolen property. If there are broken windows and doors, these need securing. It is probably better if you move out temporarily, so ask friends or family if they can offer you a bed for the night. Once the police report is complete, you can begin the clean-up process. If there is a lot of mess and fingerprint powder everywhere, call in professional crime scene cleaners to restore your home back to a livable condition. Once the initial shock has worn off, you are likely to experience feelings of intense loss and anger. The loss comes from the realization that precious and irreplaceable items are now gone forever and anger stems from having your sense of wellbeing stolen by a stranger. You will also be frightened. Fear is perfectly normal. Feelings of intense anxiety and distress are common after a burglary. You probably won’t want to be alone in the house and the slightest noise will set off alarm bells. Some people can’t stand being in their home after a traumatic burglary, so they sell up and move. It is essential that you ask for support in the aftermath of a burglary. Avoid blaming others for what happened and don’t let fear overwhelm you. Many people find that it helps to talk to a counselor or others who have experienced similar things. Try to return to a normal routine and look to the future. Bad things happen, but they don’t define us.